This is Korkie (aka LuLu and Lefty), she's a mix. We're thinking... German Shepard - Corgi - Golden Retriever. She joined our home in the early part of October 1999. At that time the shelter said she was 3-4 months old. Someone abandoned her at the shelter, they fixed her up, named her Lefty - figured out she was a female and re-named her LuLu. 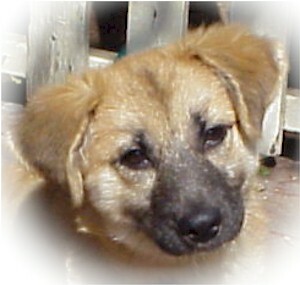 Then we came along, adopted her and named her Korkie. About the name... I was walking her, trying to figure out what type of breed she was and settled on "mostly a corgi" (she's very short). So she's sniffing something and I'm thinking "that doesn't look like something she should eat!" I'm like "Corgi, no." So, then I'm like calling her Corgie. And that's kind of like calling to your child "Human, time for dinner." But, I kind of liked the name Corgi. So, I started flexing it.. with a little bit of effort I was stumped. - Then I started thinking of other dogs I've loved. Cooper was my first dog love (don't go there). He was a golden retriever / Lab, something like that, my grandparents dog. They got him down near the old "Cooper House" in Santa Cruz, CA. He was a great dog, loving, kind, protective and lots of fun. I think I get my appreciation for dogs from the love I had for Cooper. 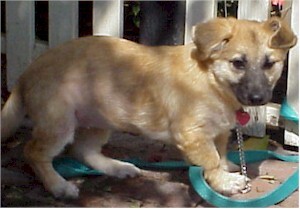 Cooper passed away years ago but before he did he fathered a litter of 15 puppies. (what a stud!). My Grand parents adopted one of the puppies with the same coloring. - Being Cooper's son(1) they named him Barrel, because coopers make barrels. Back to our pooch - Korkie. Korkie has similar coloring to Cooper and to Barrel for that matter, but she's got some Corgi mix in her that makes her very short. Now, I don't know about you, but when I think of coopers and barrels I also think of wine, and when I think of whine I think of corks. Now cork and corgi sound similar to my warped mind. And cork fits in the family naming line. And by this time the walk was over. When I broke the news to Daria, she's like "Korkie!" - and there you go. 1)Until recently I thought there was no actual relation ship between Cooper and Barrel, my younger sister straightened me out by providing the details of Barrel's birth and line. -thanks Marina!